The Fitbit Versa is a good looking and swim proof Smart Watch that keeps you on track to look pretty good yourself, thanks to its health and fitness management features. The personal Fitbit Dashboard will guide you as you strive to reach your individual goals. Meanwhile, the Fitbit Today feature is a simple way to check daily stats and progress, plus personalised insights and reminders right there on your watch. It's also nice and easy to track the length and quality of your sleep and its different stages, including light, deep and REM sleep. Female health tracking can be accessed to log periods, track your cycle and gauge ovulation. There's no need to worry about becoming chair-bound! Regular "Reminders to Move" will gently encourage you to keep up periods of activity during the day. The Fitbit Versa will lead you through a guided breathing session that's based on your heart rate. While we're talking about matters of the heart, the PurePulse Heart Rate feature tracks all-day heart rate, resting heart rate and heart rate zones during workouts. With at least 15 exercise modes, including Swim and Run, the Fitbit Versa lets you monitor real-time statistics while you exercise. Personalised dynamic coaching is also available. Connect to your phone's GPS too see pace and distance during runs or rides. For even more convenience, the Versa can offer more than four days of battery life, store more than 300 songs, and let you shop and run with the Contactless Payment feature. 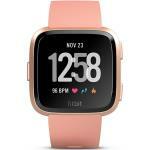 A newer model Fitbit Versa 2 was released in April 2019.